Since Pokemon: Let's Go, Eevee is, in more ways than one, a revamped remake of Pokemon Yellow, it was expected that a number of core aspects of the original game would continue to be in place. 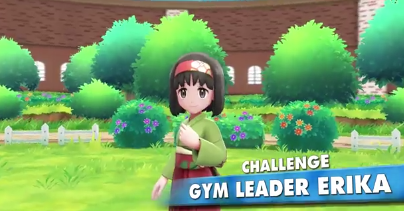 In one of the gameplay videos leading up to the release of Pokemon: Let's Go, Eevee, it was revealed that Erika will make her return as the Celadon City Gym Leader in said game. Even though it has yet to be revealed what Pokemon (and at which Levels / Combat Power) Erika will own in Pokemon: Let's Go, Eevee outside of her trusty Vileplume, many expect her to also have Weepinbell and Tangela in battle with her. These are the same Pokemon she had in the original First Generation Games (as well as the later remakes of such), and one should expect and prepare to face these same Pokemon.